The UK government recently gave permission to Kathy Niakan, a researcher at the Francis Crick Ins-titute, London, to use a controversial gene editing technology to alter genes in the human embryo. Niakan will use a technology called Clustered, Regularly Inter-spaced, Short Palindromic Repeat (CRISPR) to knock out OCT4—a gene important for the development of master cells—to prevent the embryo from surviving beyond 14 days. This means the embryo will not be implanted into a woman’s womb. Experts believe that this experiment could answer important questions about infertility by identifying the gene responsible for it. The gene editing market is spreading worldwide, and the market was worth about US $1.8 billion in 2014, and is expected to grow to about US $3.5 billion in 2019. But scientists, ethicists and policymakers are divided over the clinical use of gene editing in human embryos, especially where modifications can be inherited. Niakan’s research is significant as it sets a strong precedent for allowing gene editing research or alteration of genes in human embryos. Gene editing in embryos has provoked a global controversy due to technological and ethical issues. Since its inception in 2012, CRISPR and other gene editing technologies have helped reverse mutations that cause blindness, stop cancer cells from multiplying and develop pest-resistant wheat varieties. For instance, scientists in London used gene editing to save one-year-old Layla from dying due to leukemia. Using genetically engineered immune cells from a donor, they killed all her cancerous cells in her bone marrow. In September 2015, scientists at the Beijing Genomics Institute used a gene editing technique called TALEN to create tiny pigs, which they intend to sell as pets. Gene editing has also be used to address shortage of organs for transplants. For instance, scientists from the Harvard Medical School in Boston, Massachusetts, USA, modified more than 60 genes in pig embryos to produce a suitable non-human organ donor (see ‘Gene editing techniques’). Many startups are trying to augment research for specific targets. For instance, ViraVecs, a Bengaluru-based gene editing company, is trying to eliminate off-target effects that inevitably arise when you engineer a mutation in a particular gene. “Along with my business partner, Srikanth Budnar, we are working to generate an ideal model system,” says Rohan H Kamat of ViraVecs. “Though CRISPR is an awesome tool, it isn’t all that easy to use. It needs knowhow and a fair bit of failures to know what works best,” adds Kamat. “The reality is that we don’t know enough about the multi-traits of genes. And if they are found, too many things need to be manipulated to get your desired phenotype,” says Chetana Sachidanandan, a professor at the Institute of Genomics and Integrative Biology, New Delhi. For instance, the genes for sickle cell anaemia were long thought to be “bad genes”. It has only now been known that though two copies of the gene cause anaemia, one provides protection against malaria. If permanent changes are made in the gene pool to do away with a pair of sickle cell anaemia genes, we will lose the benefit that the other can provide. More than custom-made babies, the primary use of gene editing would be in correcting genetic errors or mutations. But correction of even a single gene isn’t 100 per cent safe. This is perhaps the only technological hindrance for CRISPR. “There are still some off-target effects associated with CRISPR, though it is the most specific gene editing technique developed till now,” adds Sachidanandan. 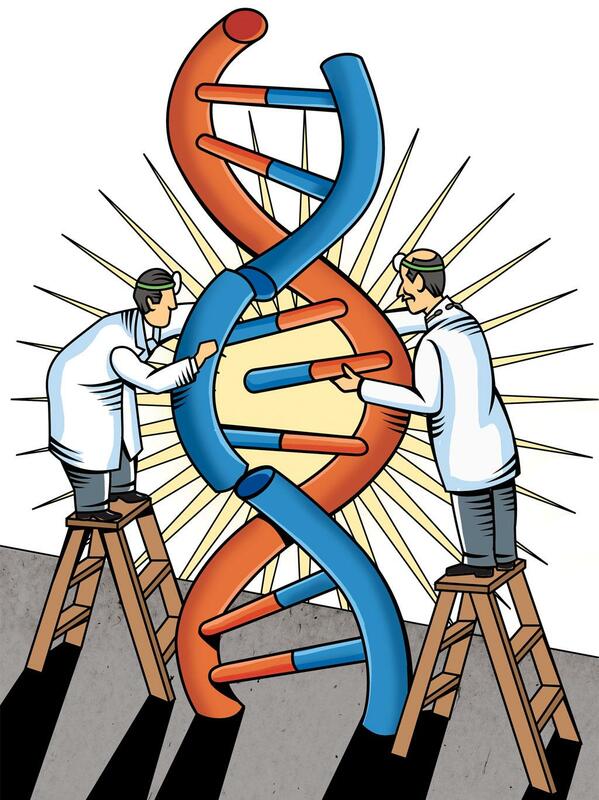 At the recent ‘International Summit on Human Gene Editing’, held in Washington DC, David Baltimore of the California Institute of Technology, said: “Today, we sense that we are close to being able to alter human heredity. Now we must face the questions that arise. How, if at all, do we, as a society, want to use this capability?” “Before we make permanent changes to the human gene pool, we should exercise considerable caution,” said Eric S Lander of the Massachusetts Institute of Technology. At the same time, it is important to note that custom-made babies are far-fetched. You cannot just have genes for intelligence and height and good looks and, voila, a baby with all of these traits! “The ‘dishes’ do not come à la carte. If you believe that made-to-order babies are possible, then you are oversimplifying how genes work,” says Nathaniel Comfort, a medicine historian at the Johns Hopkins University in Baltimore, USA. “After all, thousands of genes are responsible for a trait such as intelligence or height. The time hasn’t come for editing all of them simultaneously, and without error,” adds Comfort. Also, what if our knowledge of genetic diseases that CRISPR sets out to cure only half-knowledge? Sachidanandan recommends gene editing should be restricted only to mutations with clear deleterious consequences. “Editing mutated genes should be the last resort, when the patient is nearing death and nothing else is working,” says P V Shivaprasad of the National Centre for Biological Sciences, Bengaluru. One contentious issue is that optimisation of certain traits may lead to a reduction in genetic diversity. It is well known that genetically diverse species are more likely to survive a catastrophe. “Optimisation of traits happens without gene editing too. What we are today is because of strong selection. Gene editing will take this one step further,” adds Shivaprasad. There are also risks of inaccurate editing (such as off-target mutations) and incomplete editing of the cells of early-stage embryos. Scientists have not been able to accurately predict the harmful effects that genetic changes may have under a wide range of circumstances experienced by the human population, including interactions with other genetic variants and with the environment. Then there is the question of the implications for both the individual as well as for future generations who will carry the genetic alterations. Once introduced into the human population, genetic alterations would be difficult to remove and would not remain within any single community or country. There is also the possibility that permanent genetic “enhancements” to subsets of a population could exacerbate social inequities. There are also moral and ethical questions in purposefully altering human evolution using this technology. This is not the first time gene editing is being done on human embryos. In April, 2015, researchers at the Sun Yat-sen University in Guangzhou, China, injected the gene responsible for ß-thalassaemia in 86 embryos, and then waited for 48 hours for the embryos to grow to about eight cells each. Of the 71 embryos that survived, 54 were genetically tested. “This revealed that just 28 were successfully spliced, and that only a fraction of those contained the replacement genetic material,” says the research. “If you want to do it in normal embryos, you need to be close to 100 per cent,” says Junjiu Huang, the lead researcher. “That’s why we stopped. We still think it’s too immature.” Interestingly, established journals such as Nature and Science had refused to publish Huang’s paper, in part due to ethical objections. So the UK’s government’s decision only adds a new twist to the ongoing technological and moral debate about gene editing on human embryos.